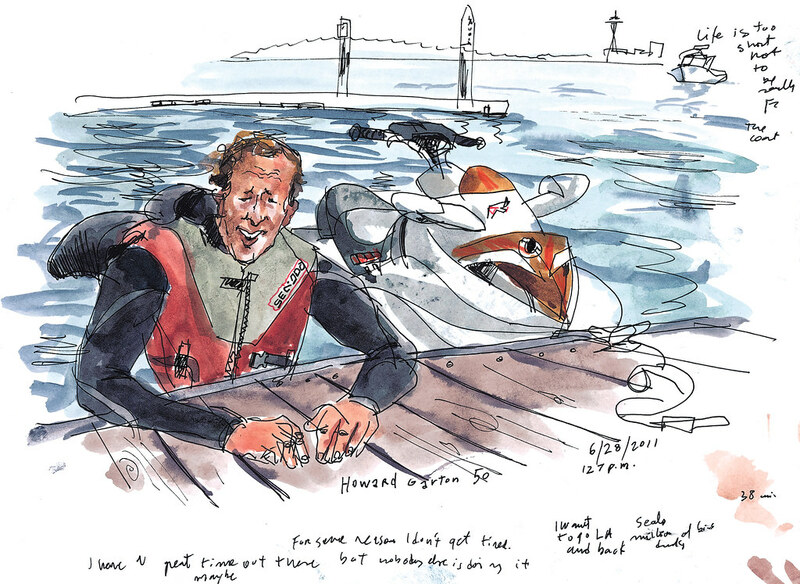 Sketched June 28, 11:46 a.m.
It’s all in a day’s work for Seattle’s newest superhero. 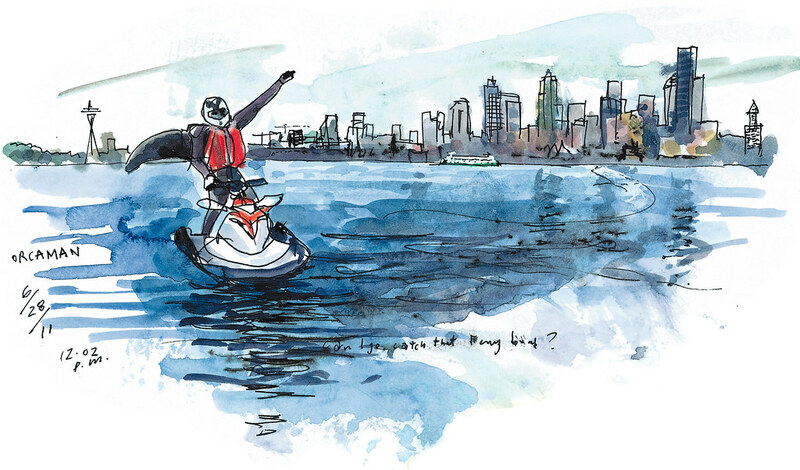 OrcaMan stands tall on a West Seattle dock, ready to jump on his Jet Ski to chase ferries, wave at the passengers and scoop up litter polluting our beautiful bay. “OrcaMan! OrcaMan!” shout some kayakers who spot him and his trademark fin. Garton is so engrossed in his character that he’s working on a comic book about it. His Vietnamese potbellied pig, Lady Bonita, who was napping in Garton’s truck when I met him this week, even appears in the story as OrcaMan’s sidekick, OrcaPorca. 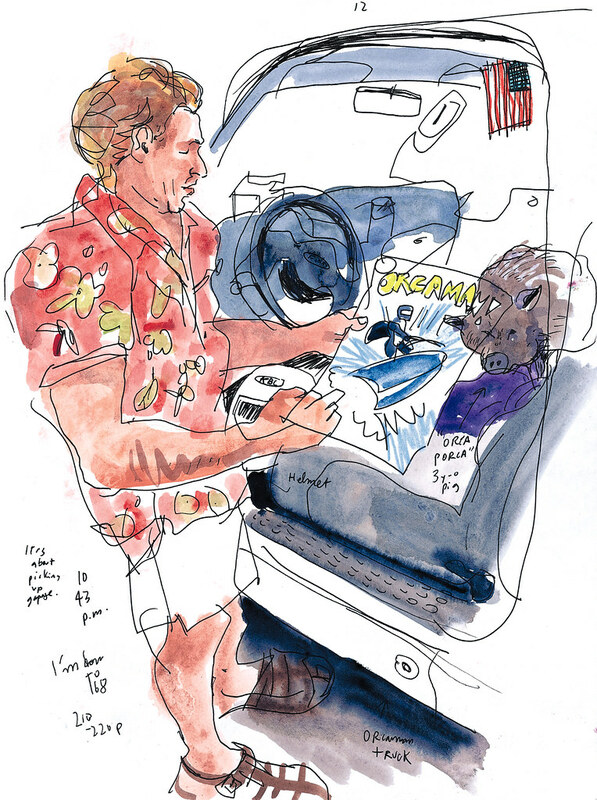 In the book, though, he rides an electric Jet Ski. OrcaMan on his way to chase the Bainbridge ferry. “That’s the one I attack the most,” he said. Garton showed me samples from his comic book while OrcaPorca napped in his truck, the same one he uses for his business as a brick mason. 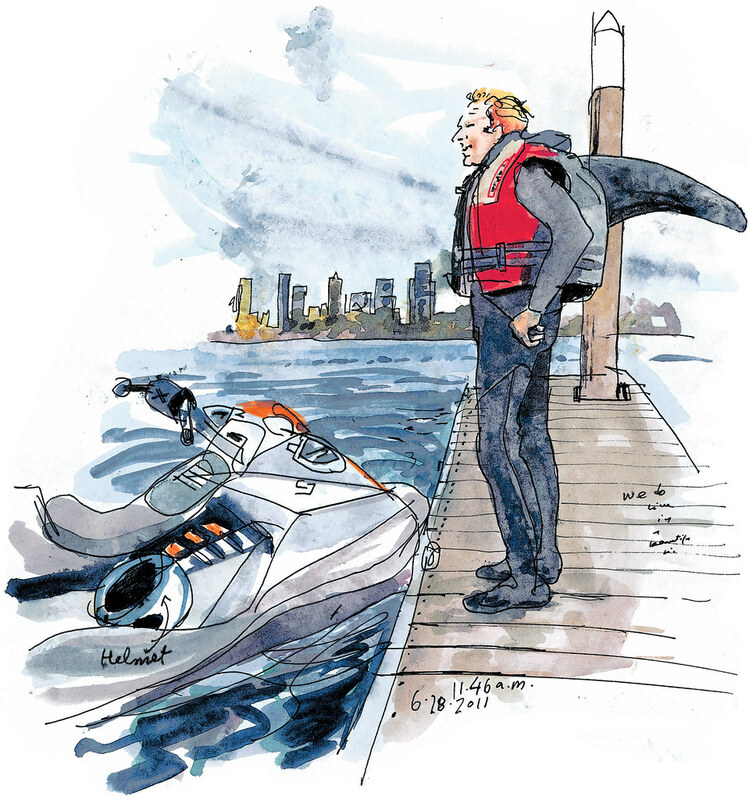 In the comic book story, OrcaMan travels the oceans tracking environmental damage. A big challenge comes his way when his arch-enemy, Corodius Krunchenviener, a.k.a. Drab Meister, kidnaps the inventor of the W.O.R.M., a Weather Optimizing Redistribution Machine that can control climate changes. Garton said he’s been working with a Capitol Hill artist on the comic book for about 15 months. There are thousands of fans waiting for it to be published, he said. 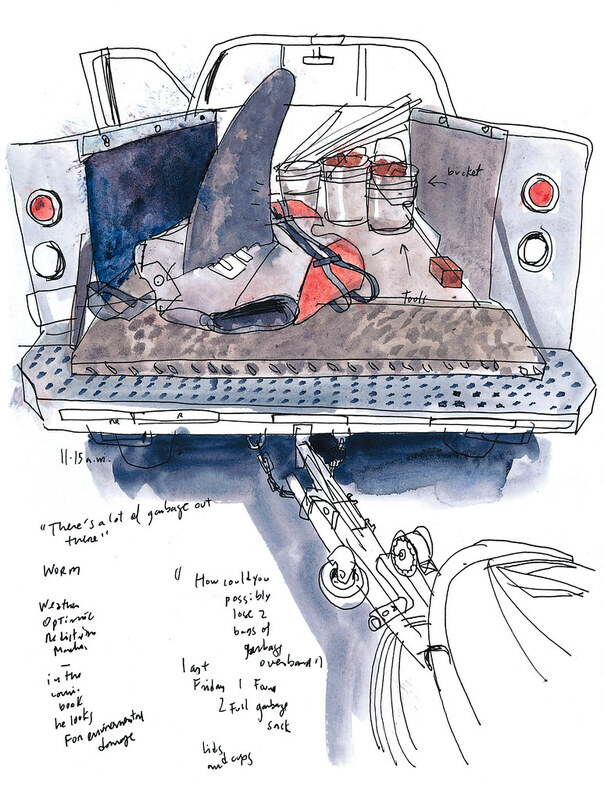 Garton’s OrcaMan gear sits on the back of his truck next to his masonry tools and buckets full of bricks. He said he modeled his fin with foam he purchased at Friendly Foam Shop in Capitol Hill. Send me your photos or sketches and I’ll share them back via Twitter or Facebook. Happy Fourth of July weekend! More information about OrcaMan at www.orcaman.org.